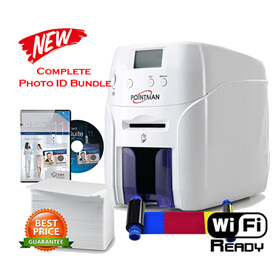 Pointman Canada offers high quality, space efficient, desktop direct-to-card printers. Pointman printer come with everything you need to start printing; card printer, cables, design software, blank cards and a colour ribbon. Pointman printers offer a full 3-year manufacturer’s warranty, which includes the printhead. With a full range of options from dual side printing, magnetic stripe, contact/contactless chip encoding, dual feed hoppers, security locks, Pointman printers are the most economical card printers in Canada.